Wait, Aaron Eckhart is the real enemy? In any other universe, The Dark Knight Rises would be hailed as the apex of superhero moviemaking, a work of such technical breadth and narrative depth that it would redefine its genre. The problem, of course, is that the final leg of director Christopher Nolan’s Batman trilogy follows its two mega-hits predecessors, the now-oddly underrated Batman Begins and The Dark Knight. Is it possible for any finale to live up to such hype and expectations? Probably not, but try and somewhat succeed as it might, The Dark Knight Rises could have done better. In assessing the scope and influence of Nolan’s seminal series, it’s interesting to note that today there remains more demand than ever for such populist popcorn-munching fare as The Avengers, Spider-Man andSuperman (indeed, the second Man of Steel reboot since Batman Begins comes out next year). Nolan’s films didn’t commandeer the genre, but instead served as the rising tide that lifted all the other comic book boats. Indeed, Nolan’s Batman trilogy is evolutionary more than revolutionary. The Batman mythos, particularly the fact that he’s a superhero without super powers, afforded Nolan a canvas to paint not only portraits about the fractured human psyche but also broad strokes about contemporary America. 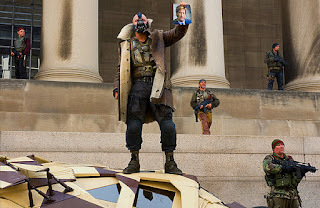 The dumbest thing about Rush Limbaugh’s latest blather (other than its source)—claiming that the use of the villain Bane in The Dark Knight Rises (a comic book character created in 1993) is a not-so-thinly veiled attack on Mitt Romney’s past work with the financial services company Bain Capital—is that Nolan’s entire Batman series has been a pulpit for post-9/11 neoconservative orthodoxy. Nolan broadens his focus to more provocative lengths in The Dark Knight Rises. The film opens with the Batman in winter, eight years after the end of The Dark Knight and taking the fall for the murder of District Attorney Harvey Dent. The myth behind Dent’s death prompted an expansion of police powers that locked away thousands of criminals and largely restored order to Gotham City’s streets. And with the return of good times, the city’s corporate community has never had it better. Batman remains in hiding, as does Bruce Wayne (Christian Bale), now a Howard Hughes-like recluse whose intervening lack of fitness has left his body hobbled from those years of leaping and falling from Gotham’s high-rises. Jim Gordon (Gary Oldman), a “wartime commissioner” on the cusp of being replaced during this era of peace and prosperity, remains haunted by the lies that helped bring about that peace and beleaguered by a fear of evil that he knows will never totally disappear. Over the ensuing weeks, Bane lords over a state of anarchy armed with a nuclear bomb harvested from a scrapped clean energy project originally financed by Wayne (take that, Greenies!). He frees the criminals, and anything of value is declared common property. Kangaroo courts presided over by Dr. Jonathan Crane (Cillian Murphy, now appearing in all three of Nolan’s Batman films) are convened to try would-be dissidents to this new social and economic construct. Unbeknownst to anyone, however, Bane’s bomb is designed to explode on its own at the end of five months. That’s also about as long as The Dark Knight Rises seems to last. An unfortunate byproduct of Nolan’s rising esteem as a filmmaker is the license to indulge that comes with it, a penchant for bloat that occasionally crept into The Dark Knight before going full-blown in Nolan’s Inception. The relatively economical 141-minute running time of Batman Begins has now metastasized into 165 minutes of amorphous atmospherics punctuated by Han Zimmer’s blaring power chords. While that’s still an hour shy of Lawrence of Arabia, you’d think Nolan would find time to tie together the strands of his labyrinthine plot. One of the film’s high points is the relationship that forms between Wayne/ Batman and Selina Kyle (Anne Hathaway, terrific), a slinky cat burglar hailing from Gotham’s seedy side. One imagines the feisty, resourceful and mostly amoral Kyle as Bruce Wayne had he grown up poor and female, and their banter oscillates between flirtatious, humorous, poignant and foreboding. Still, the genesis of Kyle’s costumed, feline-themed alter ego (the name “Catwoman” is never uttered) gets little screen time, as does the basis of her mysterious association with Bane. Faithful butler and confidant Alfred Pennyworth (Michael Caine) disappears during the first half of the film only to briefly reappear at the end, both without logical explanation, and the film suffers from the absence of his emotional core. Joseph Gordon-Levitt does a fine job playing John Blake, an honest Gotham cop, but he garners more screen time than Bane and uses most of it expounding bromides about justice and steering orphans away from one danger or another. And, Wayne’s tryst with Miranda Tate (Marion Cotillard), a Wayne Enterprises board member and sustainable energy activist, is totally unbelievable and purposeless. Large portions of the storyline to The Dark Knight Rises derive from DC Comics’ 1993 “Knightfall” story arc—fanboys needn’t worry about Nolan pulling his punches in depicting the epic first fight between Batman and Bane. Moreover, Nolan ably brings his film saga full circle, revisiting the League of Shadows that Wayne rebelled against in Batman Begins and the power of mythmaking that informed the conclusion to The Dark Knight. However, while The Dark Knight Rises is high on pathos and allegory, it’s also unwieldy and lacks the charisma, wonder and sense of discovery found in its forerunners. Hardy is a compelling young actor, but it may as well have been Vin Diesel obscured behind Bane’s ever-present mask and digitally distorted voice. And, when it’s hard to shake the notion that the villains’ motives and backstory were partly derived from a middling James Bond entry like The World Is Not Enough, it becomes even dicier to divine import from the rest of the morass. The Dark Knight Rises is both entertaining and interesting. But it is not the grand, transformative spectacle that Nolan obviously intended. Many of its missteps are of its own making. But like its Caped Crusader, it also buckles from the demands heaped upon it by the 99 Percent who have enjoyed and now justifiably come to expect success.